Get complete visual coverage inside and out with FortiCameras. With options for indoor and outdoor, vandal-proof, weatherproof, low-light night vision and 2-way audio, there’s a FortiCam that fits every environment. Compact and unobtrusive, all FortiCams deliver crisp, high-resolution HDTV-quality images to the FortiRecorder NVR, either continuously or triggered by a range of events, including motion and/or audio detection. With FortiCameras, installation is a breeze. Both cameras support PoE, eliminating the need for AC power. Just connect them to the FortiRecorder network via a PoE switch and you’re up and running. No software installation, no patches and no per-camera fees. Discreet and compact, the FC-MB13 indoor camera fits anywhere. But don’t let its size fool you — this camera can see in the dark and detect motion or audio. With 30 built-in infrared LED bulbs, it can capture events up to 50 feet away at night. With DI/DO for external alarm and sensor devices. Vandal-proof (IK10), weatherproof (IP67) and motion-detecting, the FCM-20A is a solid but subtle powerhouse that’s great for securing your perimeter but still looks unobtrusive indoors. 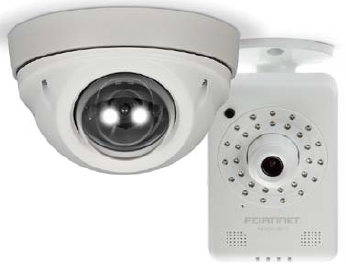 Combined with the FortiRecorder NVR, FortiCameras give you everything you need for complete facility video security. Clear high-definition visuals, even in the dark Your security footage won’t be much use if you can’t see what’s going on. HDTV-quality and advanced low-light and infrared options ensure that you can see the details. Auto-discovery by FortiRecorder NVRs Set up is a snap: plug into FortiRecorder network and the rest is automatic. Download the Fortinet FortiCamera Series Datasheet (PDF).